The Love Rocks 5k Run/Walk will be at Tom McCall Upper Elementary School on June 30. It all began with two little girls, a handful of stones and a jar of Modge Podge. 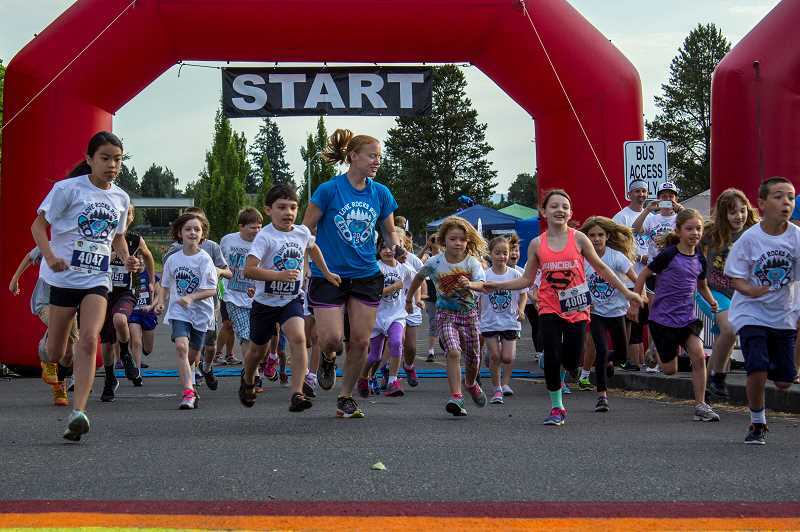 The Love Rocks Run 5k Run/Walk and Community Fair returns to Washington County on Saturday, June 30 at 8 a.m.at Tom McCall Upper Elementary School, 1255 S.W. Pacific Ave., in Forest Grove. The race honors the legacy of Tom Robinson and Susan Dieter-Robinson's two daughters, who died in a heartbreaking accident five years ago. "On Oct. 20, 2013, the unthinkable happened to my family," Dieter-Robinson said. "My daughters, Anna, 6, and Abigail, 11, were hit by car in front of our house. Both girls went to Heaven that night without warning." The girls' deaths reverberated throughout the community. The Robinson family transformed heartache into a heartwarming worldwide movement. "Our hope when we started Love Rocks is that people would remember our girls by who they were and how much love they shared and not by what happened to them," Dieter-Robinson said. Dieter-Robinson said she didn't want people to say the girls' names and become sad, but rather say their names and get giant smiles on their faces because of all the love and joy they have shared. "I am so proud of Anna and Abby and what they have done for so many," Dieter-Robinson said. "These little rocks are a tangible token of hope for me." After the race, everyone is invited to participate in the post-race community fair, with live music, food, drinks, non-profit businesses and community services. There will be Star Wars characters, princesses, magicians, balloon artists and face-painters in attendance, making the event much more than a run, organizers say. Many people register the day of the event, but Dieter-Robinson encourages people to sign-up early so they can make sure to have enough shirts and goodie bags for everyone. 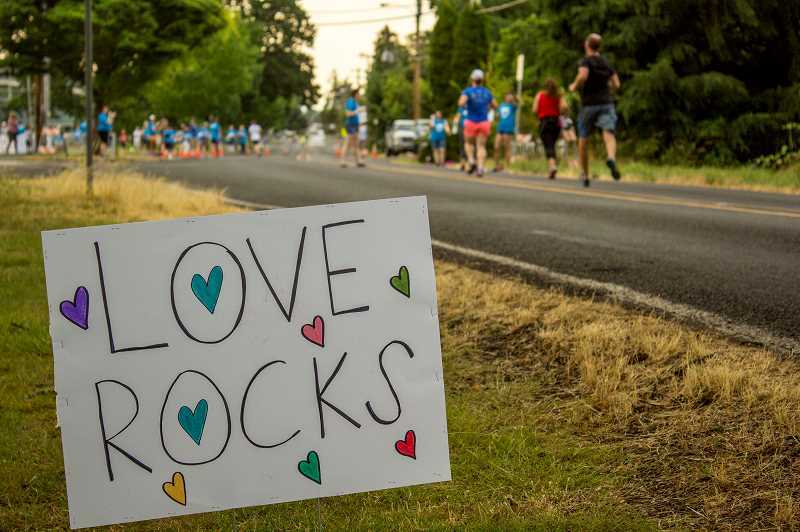 The run is the primary fundraising event for the Love Rocks Foundation, which was started by the couple to create and provide actions that celebrate love, joy and community in the Forest Grove area. "The Love Rocks Foundation was started to honor the legacy of love and joy of Anna and Abigail, sisters who teach everyone who hear their story how to live a love-drenched life," said Race Director Jennifer Webber. Last year's Love Rocks event drew nearly 800 people and raised $11,000, which helped pay for the run and also provided support to The Western Washington County Firefighter's Association, as well as the Cold Weather Homeless Shelter of Forest Grove. "Our plan is to always give back to our community with the proceeds from the run," Dieter-Robinson said. The Foundation was sparked in 2014, a few months after the girls' death, Dieter-Robinson said. "Tom and I felt nudged to share a project that we as a family did for our wedding in June of 2011," she said. "The girls, Tom's mom and I spent time cutting out fabric hearts from our favorite fabrics and then Mod Podging them to river rocks." The rocks were adorned with hearts and presented to wedding guests to take home. Other rocks one were written on by guests for the Robinsons to keep. That little nudge took on a life of its own, Dieter-Robinson said. The family launched a Love Rocks Facebook page, shared a bit of their story and their hope for spreading love and joy through the simple rocks. She included a tutorial on how to make them. Since that day, Love Rocks have been left on all seven continents. There are photos of Love Rocks in parks, on beaches, on The Great Wall of China, in front of the Eiffel Tower, on doorsteps, in hospitals, at weddings and at funerals, she said. Love Rocks have even appeared in a secured NASA facility. "These little rocks have held a lot of meaning in our house since our wedding day and are placed in various rooms so that we can enjoy them no matter where we are," Dieter-Robinson said. "I have received countless Love Rocks stories from people all over the world, who after finding a Love Rock felt joyful," she added. "I often say that Love Rocks find those who need them the most. There are so many broken and hurting hearts in this world and I think people sometimes need something tangible to hold on to. Love Rocks are easy to hold on to." People of all ages attend and participate in the Love Rocks event. "People ages 0-99, families, singles, all cultures, and beliefs. Anyone who believes in love and joy is welcome to participate," Dieter-Robinson said. The family has lots of plans for the organization. Dieter-Robinson hopes to turn the Foundation into a nonprofit. A future plan for the event includes possibly adding a 10k to the run next year. "The proceeds from the Love Rocks Run will help us to support the Love Rocks Foundations mission," she said. "One way in which we plan on doing this is having a Love Rocks Scholarship, which will start the year Abby would have been graduating Forest Grove High School, in 2020. Our board is still in the process of working out all the details for this and all the other ways we plan on spreading love and joy." Dieter-Robinson said they are extremely grateful for all the amazing volunteers that help make the Love Rocks Run happen every year. "We are also very grateful to Jen Webber, the Love Rocks Run coordinator, for all the hard work and dedication she puts into making the run a success. She, along with a handful of very dedicated volunteers, have been so busy planning and we truly could not thank them enough for everything they do to help us make the Love Rocks Run so wonderful," Dieter-Robinson added. For more information, visit love-rocks.org.